Perhaps you already noticed this newly featured recipe on the Kraft Foods website (or if you follow me on Pinterest, perhaps you have already “pinned” it!) I love how simple the Kraft recipes are for the amount of flavor they produce! Simple and to the point recipes and ingredients with a big, big payoff. Bonus points for only needing to dirty 1 skillet! Spoiler alert: It tastes as good as the picture shows. 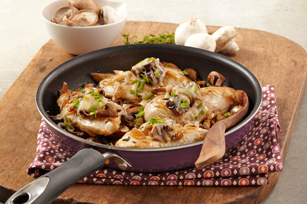 Cook mushrooms and onions in large nonstick skillet on medium-high heat 10 minutes, stirring occasionally. Add dressing, garlic, thyme; cook 5 to 7 minutes or until mushrooms are tender, stirring frequently. Transfer to bowl; cover to keep warm. Add chicken to skillet; cook 5 minutes on each side until done. Top chicken with mushrooms and cheese; cover. Cook 2 to 4 minutes or until cheese is melted; sprinkle with chives.